Cultured human cells are pivotal models to study human gene functions, but introducing complete loss of function in diploid or aneuploid cells has been a challenge. The recently developed CRISPR/Cas9-mediated homology-independent knock-in approach permits targeted insertion of large DNA at high efficiency, providing a tool for insertional disruption of a selected gene. Pioneer studies have showed promising results, but the current methodology is still suboptimal and functional outcomes have not been well examined. Taking advantage of the promoterless fluorescence reporter systems established in our previous study, here, we further investigated potentials of this new insertional gene disruption approach and examined its functional outcomes. Exemplified by using hyperploid LO2 cells, we demonstrated that simultaneous knock-in of dual fluorescence reporters through CRISPR/Cas9-induced homology-independent DNA repair permitted one-step generation of cells carrying complete disruption of target genes at multiple alleles. Through knocking-in at coding exons, we generated stable single-cell clones carrying complete disruption of ULK1 gene at all four alleles, lacking intact FAT10 in all three alleles, or devoid of intact CtIP at both alleles. We have confirmed the depletion of ULK1 and FAT10 transcripts as well as corresponding proteins in the obtained cell clones. Moreover, consistent with previous reports, we observed impaired mitophagy in ULK1−/− cells and attenuated cytokine-induced cell death in FAT10−/− clones. However, our analysis showed that single-cell clones carrying complete disruption of CtIP gene at both alleles preserved in-frame aberrant CtIP transcripts and produced proteins. Strikingly, the CtIP-disrupted clones raised through another two distinct targeting strategies also produced varied but in-frame aberrant CtIP transcripts. Sequencing analysis suggested that diverse DNA processing and alternative RNA splicing were involved in generating these in-frame aberrant CtIP transcripts, and some infrequent events were biasedly enriched among the CtIP-disrupted cell clones. Multiallelic gene disruption could be readily introduced through CRISPR/Cas9-induced homology-independent knock-in of dual fluorescence reporters followed by direct tracing and cell isolation. Robust cellular mechanisms exist to spare essential genes from loss-of-function modifications, by generating partially functional transcripts through diverse DNA and RNA processing mechanisms. Recent breakthroughs in engineered nucleases have marked a new era for genome editing. Three main technologies, Zinc-finger nucleases (ZFNs) , transcription activator-like effector nucleases (TALENs) , and bacterial clustered regularly interspaced short palindromic repeats (CRISPR)-associated protein 9 (Cas9) system [3, 4], employ different mechanisms to recognize target DNA and introduce site-specific double-strand breaks (DSB) with high accuracy. Among these advances, the CRISPR/Cas9 system, which was originally identified to confer adaptive immunity in bacteria and archaea, has made a particularly huge impact due to its superior simplicity, low cost, and robust performance [5–7]. By forming a complex with programmable short guide RNAs (sgRNAs), Cas9 endonuclease can be directed to any pre-selected location in complex genome through complementary base pairing [3, 4]. Subsequent DNA cleavage by the sgRNA/Cas9 complex at a target site triggers intrinsic DNA repair, mainly via non-homologous end joining (NHEJ) or homology-directed repair (HDR) pathways, which allows scientists to introduce various genomic modifications in a site-specific manner [8, 9]. Currently, CRISPR/Cas9 system is widely used to augment HDR-based knock-in or knockout by inducing DNA breaks at selected target sites, and these strategies have enabled precise gene targeting in human pluripotent stem cells . Meanwhile, CRISPR/Cas9-induced NHEJ is often exploited to generate loss-of-function effects in various cells and organisms, through introducing random insertions/deletions (indels) at a single target site or deleting large fragments by applying paired or multiple sgRNAs [3, 11, 12]. Human cell lines maintained under culture conditions are pivotal models for direct analysis of human gene functions. Since most cultured cells possess diploid or hyperploid genomes, meaning that a single gene is often presented as two or more copies in the genome, knockout or targeted disruption to introduce complete loss of function of a selected gene has been technically challenging in these cells. HDR-based strategies require cloning of homology arms specific to each target locus, and it remains tedious to modify multiple alleles to abolish target gene function completely. Whereas, NHEJ-mediated mutagenesis or deletions provide no means for enrichment and isolation of target cells; hence, non-selective clonal expansion and thorough screening analysis, which are often labor-intensive, are required to identify target cells harboring desired genome modifications. Recently, studies have exploited the NHEJ repair mechanism to knock-in DNA at CRISPR-induced DSBs in both zebrafish and mammalian cells [13–15]. By targeting constitutively expressed house-keeping gene GAPDH at 3′-UTR using promoterless fluorescence reporters, we directly compared frequencies of knock-in mediated by CRISPR-induced NHEJ and HDR repair mechanisms . We found that knock-in via CRISPR/Cas9-induced NHEJ is superior to the commonly used HDR-based method in all human cell lines examined . Soon after, Zhou et al. applied this homology-independent knock-in strategy to introduce antibiotics/toxin resistance, and they successfully enriched target cells carrying desired gene disruption through drug selection . However, drug selection often takes long time, and the effect varies among different cell types. Furthermore, functional outcomes from these targeted gene disruptions have not been examined . In order to fully harness the recent technologies for targeted gene disruption, we took advantage of our previously established promoterless fluorescence reporter systems which produce signals only upon correct integrations, thus allowing direct tracing and cell isolation, and employed homology-independent knock-in of dual-reporters, to introduce multiallelic gene disruption in this study. To verify if NHEJ-based knock-in could introduce reporter expression and trace disruption of target gene at the same time, we performed a proof-of-principle experiment. We employed LO2-GFP cells generated previously  and constructed two different sgRNAs to target the constitutively expressed GFP transgene. To trace the new NHEJ knock-in events, we constructed a new donor that carry ires-tdTomato (ires-Td) together with a sg-A target site at its 5′ end, termed ires-Tddonor (Fig. 1a). The sg-A is a previously established sgRNA targeting non-mammalian sequence . Together with Cas9, it will introduce DSB in the donor carrying corresponding target sequence for subsequent integration . Indeed, after cotransfection of the ires-Tddonor/Cas9/sg-A with either sgRNA targeting GFP, we detected a distinct Td+/GFP− population in company with a reduction in GFP+ fraction, by fluorescence-activated cell sorting (FACS) (Fig. 1b). Fluorescence imaging further confirmed that the expression of GFP and tdTomato were largely exclusive to each other among the transfected cells (Fig. 1c). These results indicate that NHEJ-mediated knock-in of ires-Td reporter could be applied to enrich the disruption of GFP transgene. 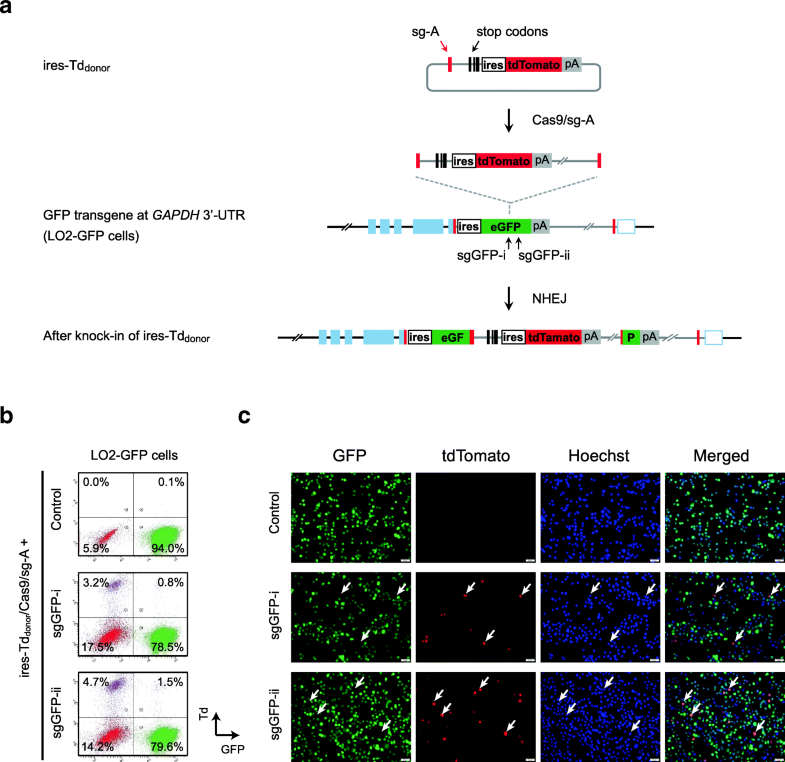 Unlike the GFP transgene which was present as a single copy in the above LO2-GFP cells, cultured cell lines often carry diploid or complex aneuploidy genomes, which poses additional challenges to complete disruption of a selected gene in these cells. We performed cytogenetic characterization of the wild-type LO2 cells. Chromosome number analysis revealed that LO2 cells carry hyperploid genome. Majority of the cells contained 68 (32.4%) or 66 chromosomes (23.0%, n = 74) (Additional file 1: Figure S1a). Subsequently, we performed fluorescence in situ hybridization (FISH) analysis to assess the copy numbers of specific genes. Here, we selected four endogenous gene loci, ULK1, FAT10, CtIP, and GAPDH for examination. ULK1 gene is a mammalian homologue of Atg1, which is known to be involved in autophagy and autophagy-mediated clearance of damaged mitochondria, a process called mitophagy [18–20]. ULK1 is often non-essential to cell survival under normal culture conditions. FAT10 encodes proteins mediating cellular responses to inflammation, and it is activated only upon exposure to inflammatory cytokine such as TNFα and/or INFγ . The CtIP protein is known to cooperate with MRE11-RAD50-NBS1 (MRN) complex to play a pivotal role in DNA repair , and it is critical to cell growth as well as early development in mice [23, 24]. The GAPDH gene is included as control due to its universal and constitutive expression. Our FISH analysis on these loci showed that copy numbers are varied among different genomic loci in LO2 cells. CtIP gene were presented at two copies, while three copies of GAPDH and FAT10, as well as four copies of ULK1 loci, were detected (Additional file 1: Figure S1b; Table S1). Together with the FISH analyses using reference probes targeting near-centromere or sub-telomere regions in corresponding chromosomes (Additional file 1: Table S1), our results reflected complicated chromosome duplications and translocations (Additional file 1: Figure S1b). The chromosome 6 (Chr6) and chromosome 12 (Chr12) were trisomy. FAT10 and GAPDH were detected within their original locations in Chr6 and Chr12, respectively, and they both were presented at three copies. Among the four ULK1 loci detected, two remained within their original locations in Chr12, while the other two copies were detected outside Chr12 (Additional file 1: Figure S1b). In order to trace insertional disruption of endogenous genes, we next assessed whether knock-in of ires-GFP at coding exons in ULK1, FAT10, CtIP, and GAPDH genes could result in detectable reporter expression to allow subsequent tracing. We constructed multiple sgRNAs targeting coding exons in these genes and cotransfected ires-GFPdonor/Cas9/sg-A with individual gene-specific sgRNAs (Additional file 1: Figure S2; left panel). Indeed, targeting ULK1 (exon-2), FAT10 (exon-2), CtIP (exon-7), and GAPDH (exon-3 or exon-8), all yielded distinct fractions of GFP+ cells (Additional file 1: Figure S2; right panel). Moreover, consistent with previous reports showing that FAT10 is weakly expressed in general but rapidly activated upon stimulation by TNFα and INFγ , GFP+ cells produced by targeting FAT10 (exon-2) could be clearly observed only in the presence of TNFα and INFγ (Additional file 1: Figure S2; right panel). Next, we cotransfected both ires-GFPdonor and ires-Tddonor, together with Cas9/sg-A and individual gene-specific sgRNAs. Targeting ULK1 exon-2 and FAT10 exon-2 yielded single-positive cells expressing either reporter or distinct Td+/GFP+ double-positive cells as showed by FACS analysis (Fig. 2a). We sorted the Td+/GFP+ double-positive and Td+/GFP− single-positive cells from the targeting at ULK1 to verify the enrichment of gene disruption. Indeed, we detected integration of GFP and Td reporters at the pre-selected target site in ULK1 exon-2 by genome PCR and confirmed that the reporter integrations were well correlated with the expressions (Fig. 2b). Moreover, we detected significant decrease of ULK1 proteins by western blot. Given that each reporter expression indicates integration/disruption of at least one ULK1 allele, we detected more reduction of ULK1 protein among Td+/GFP+ double-positive cells compared to that in Td+/GFP− single-positive cells (Fig. 2c). We raised single-cell clones from the collected Td+/GFP− and Td+/GFP+ cells and performed genome PCR analysis on individual clones. Strikingly, among 26 clones raised from Td+/GFP+ double-positive cells, we confirmed 12 clones to be devoid of any intact ULK1 allele (Fig. 2d), meaning the success rate of establishing complete disruption of ULK1 gene at all four alleles by dual-reporter tracing was around 46.2% (Fig. 2d; Additional file 1: Figure S3a). Contrarily, out of the 21 clones raised from Td+/GFP− single-positive cells, none showed complete disruption of ULK1 at all four alleles (Fig. 2d). Similarly, we analyzed single cell clones generated from the targeting at FAT10 exon-2. From 24 clones raised from Td+/GFP+ double-positive cells, we identified 6 clones (25.0%) lacking intact FAT10 alleles, whereas among 14 clones raised from Td+/GFP− single-positive cells, we confirmed two clones with complete disruption (14.2%) (Fig. 2d; Additional file 1: Figure S3b). Collectively, these data indicate that NHEJ-based knock-in of dual fluorescence reporters could directly trace and facilitate enrichment of cells with multiallelic gene disruption. It is worth noting that RT-PCR analysis on the three selected ULK1−/− clones further confirmed the absence of intact ULK1 transcripts, as well as the presence of chimeric transcripts yielded from the integration of ires-GFP and ires-Td reporters at the target site (Fig. 2e). Meanwhile, western blot analysis verified the loss of ULK1 protein in these clones (Fig. 2f). More interestingly, we found that challenging these ULK1−/− cells with mitochondrial toxin Oligomycin and Antimycin A resulted in rapid mitochondria damage and depolarization, while the wild-type LO2 cells retained relative normal mitochondria as detected by MitoTracker Red (Fig. 2g). This result is consistent with the previous study on ULK1 in mitophagy, indicating that ULK1 plays an important role in clearing damaged mitochondria through autophagy and maintaining mitochondrial homeostasis [18, 20]. Similarly, we confirmed the depletion of intact endogenous FAT10 mRNA as well as the acquisition of chimeric transcripts in two selected FAT10−/− clones (Fig. 2h). Western blot analysis further verified that these FAT10−/− clones failed to produce FAT10 proteins upon induction by TNFα and INFγ; instead, they produced GFP proteins from the integrated transgene (Fig. 2i). Consistent with previous reports that activation of FAT10 caused cell apoptosis , we found that the FAT10−/− cells showed increased cell survival compared to wild-type LO2 cells upon the treatment with TNFα and INFγ (Fig. 2j). Moreover, the increased cell survival in the FAT10−/− cells could be abolished by ectopic expression of FAT10, indicating that FAT10 was indeed involved in the TNFα/INFγ-induced cell death (Fig. 2k). Altogether, these results supported that NHEJ-based simultaneous knock-in of dual fluorescence reporters successfully enriched and established targeted disruptions of ULK1 and FAT10 genes at high efficiency. Interestingly, while the NHEJ-based simultaneous knock-in of dual reporters successfully established stable clones carrying complete disruption of ULK1 at four alleles or devoid of FAT10 at three alleles in the hyperploid genome, targeted disruption at the biallelic CtIP gene yielded complicated results. Cotransfection of both ires-GFPdonor and ires-Tddonor, together with Cas9/sg-A and sgCtIP targeting CtIP exon-7, produced detectable GFP and tdTomato signals to support cell sorting (Fig. 3a). However, among 24 single-cell clones raised from Td+/GFP+ double-positive cells, only two clones were found to carry CtIP-disruption and they failed to expand subsequently (8.3%). Rather surprisingly, we identified 6 CtIP-disrupted clones out of 23 clones raised from Td+/GFP− single-positive cells, indicating a success rate higher than that from the double-positive cells, at 26.1% (Additional file 1: Figure S4a). We selectively analyzed four clones isolated from the Td+/GFP− cells, termed CtIPE7ires−/− clones, and detected targeted insertions of donors at both forward and reverse orientations in each clone (Fig. 3b). Surprisingly, despite of the absence of intact CtIP alleles, significant amounts of CtIP transcripts were detected in these cells, using primers matching to CtIP mRNA at both the target and non-target regions (Fig. 3c). Moreover, reduced yet substantial amounts of CtIP proteins were detected in all four clones by western blot (Fig. 3d). More interestingly, sequencing analysis revealed three different aberrant transcripts (CtIPires v1–3) from these clones, and they all preserved the original reading frame of CtIP mRNA (Fig. 3e). Sequence alignment suggested that all these CtIPires transcripts were produced from reversely integrated donors, but not from the forward integrations which were confirmed by genome PCR and produced Td+ signal detected by FACS analysis (Fig. 3a, b). One cryptic splice donor (SD) site from reverse donor backbone likely paired with the splice acceptor (SA) site of CtIP exon-8, resulting in a short insertion of the donor sequences (Fig. 3e, f; shade in light green) together with the deletion of 3′-part of CtIP exon-7 (exon-7b; − 55 bp) in all three aberrant transcripts. Additionally, CtIPires v1 carried a 15-bp deletion near the sgCtIP target site, while CtIPires v3 contained an extra insertion (+ 78 bp), which was likely originated from the reverse donor backbone and produced through a weak splicing event (Fig. 3e, f; shades in beige). Besides the varied alternative RNA splicing, the sequencing data also indicated that CtIPires v2 and V3 carried sgCtIP target sequences cleaved at the 4th nucleotide instead of the commonly used 3rd nucleotide upstream of the protospacer adjacent motif (PAM)  (Fig. 3e, f; asterisks). The apparently biased enrichment of reverse integration and alternative DNA cleavage by Cas9/sgCtIP in all these cell clones suggested that the in-frame aberrant CtIPires transcripts were likely to be functional and beneficial to cell survival. This is consistent with the reported CtIP function in DNA repair, and it explains why the double-positive CtIP-disrupted clones failed to expand eventually. To examine the generality of above observations, we employed distinct donors pgk-GFP/Tddonor to target CtIP exon-7 for gene disruption (Fig. 4a, left panel). Differently from the promoterless donors used above, pgk-GFP/Tddonor carried an active PGK promoter and supported constitutive reporter expression regardless the orientation of insertion . Similarly, we performed cotransfection of dual pgk-GFP/Tddonor and Cas9/sg-A/sgCtIP and sorted Td+/GFP− and Td+/GFP+ cells for clonal analysis (Fig. 4a; right panel). Among the 21 clones raised from Td+/GFP+ double-positive cells and 15 clones from Td+/GFP− single-positive cells, we identified 10 (47.6%) and 9 (60.0%) clones respectively, to be devoid of intact CtIP alleles (Fig. 4a; Additional file 1: Figure S5a). Interestingly, selective analysis of six clones raised from either double-positive cells or single-positive cells revealed that they all harbored reverse integrations (Fig. 4b), while in contrast, only three clones carried forward insertions (Fig. 4b). 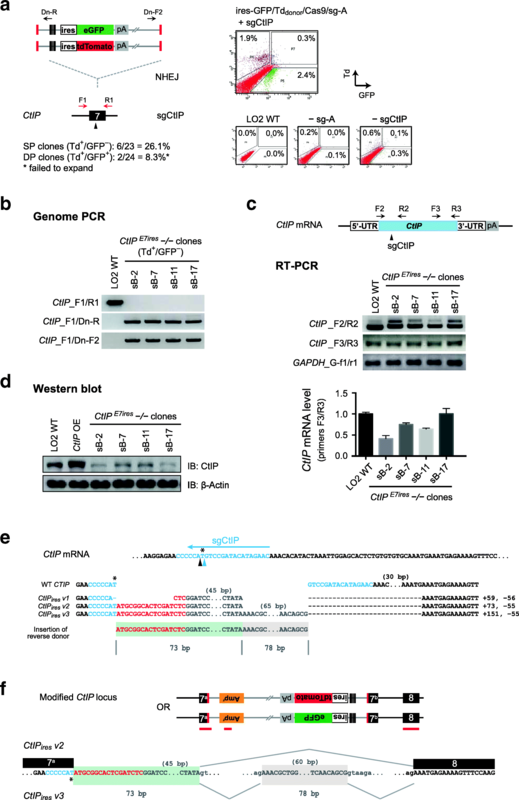 Similar to the targeting with ires-GFP/Tddonor, RT-PCR analysis of these CtIPE7pgk −/− clones detected substantial amounts of CtIP transcripts covering either the target or non-target regions (Fig. 4c), and western blot detected reduced yet substantial amounts of CtIP proteins (Fig. 4d). Sequencing analysis showed that, again, the aberrant transcripts (CtIPpgk v1 and v2) were all in-frame and produced from the modified alleles carrying reverse integration (Fig. 4e, f; Additional file 1: Figure S5b). Splicing likely happened between a distinct SD site embedded in the new donor backbone and the SA site of CtIP exon-8 (Fig. 4f), thus resulting in an insertion of distinct donor sequences and partial deletion of CtIP exon-7 (exon-7b; − 55 bp) (Fig. 4f). Interestingly, an additional deletion (− 151 bp) was observed within the donor sequences embedded in the CtIPpgk transcripts, which yielded a final insertion at 73 bp and net insertion of 18 bp, same to that in CtIPires transcripts (Fig. 4f). Verification on the vector, modified genome and aberrant transcript sequences suggested that the additional 151-bp deletion was likely to be introduced by a microhomology-based recombination event at genome level (Additional file 1: Figure S5b, c). Furthermore, the longer variant CtIPpgk v2 was found to carry an additional short insertion (+ 78 bp) from vector backbone, which was identical to that in CtIPires v3 and likely to be produced from a similar weak splicing event (Fig. 4f; Additional file 1: Figure S5b, shade in beige). Finally, these aberrant CtIPpgk transcripts also carried sgCtIP target sequences cleaved at the 4th nucleotide. Altogether, these analyses detected various combinations of DNA processing and RNA splicing, which yielded two distinct CtIPpgk transcripts and both were in-frame (Fig. 4e, f; Additional file 1: Figure S5b, c). These data are consistent with the results obtained above using ires-GFP/Tddonor, suggesting that the escapee cells might be generated under survival stress through producing various partially functional CtIP transcripts and proteins. To prove the generality of above observations, we also targeted proximal 5′-UTR of CtIP to introduce gene disruption via the NHEJ-based knock-in approach. We generated new donors by deleting the ires element from previous constructs and termed them 5′GFP/Tddonor. Cotransfection of the 5′GFPdonor/Cas9/sg-A together with individual sgRNAs targeting 5′-UTR of GAPDH or CtIP genes confirmed that targeting at two out of the three selected target sites yielded significant fractions of GFP-positive cells (Additional file 1: Figure S6a). Next, we cotransfected both 5′GFPdonor and 5′Tddonor together with Cas9/sg-A /sg5′CtIP for simultaneous knock-in at CtIP 5′-UTR and detected a small but distinct fraction of Td+/GFP+ double-positive cells (Fig. 5a). Western blot analysis of the sorted cells confirmed significant reduction of CtIP proteins and revealed more severe reduction in the Td+/GFP+ double-positive than that in Td+/GFP− single-positive cells (Fig. 5b). We examined 10 single clones raised from the double-positive cells and identified 3 clones (30.0%) lacking intact CtIP genes (Additional file 1: Figure S6b), termed CtIP5’UTR−/− clones. RT-PCR confirmed the absence of intact wild-type CtIP transcripts in these cells (Fig. 5c; CtIP_F5/R5). However, using primers covering a longer region around the target site, we detected shortened aberrant transcripts (Fig. 5c; CtIP_F5/R5*). Consistently, substantial amount of transcripts was detected using primers to the non-target region in CtIP mRNA (Fig. 5c; CtIP_F3/R3), and western blot analysis confirmed the presence of trace CtIP proteins (Fig. 5d). Sequencing analysis of the aberrant CtIP5’UTR transcripts showed that they were produced from forwardly integrated donors (Fig. 5e; Additional file 1: Figure S6c). The integrated donor sequences were largely spliced out together with the 3′-part of CtIP exon-1 (exon-1b; 188 bp) carrying the start codon, through two cryptic splicing events. CtIP5′UTR v1 was likely to be produced through pairing between an endogenous cryptic SD site upstream of the sg5′CtIP target site and the SA site of CtIP exon-2. Hence, it lacked a large fragment (− 207 bp), including 19 bp upstream of the sg5′CtIP cleavage site and the 3′-part of exon-1 (exon-1b; 188 bp). CtIP5’UTR v2 was probably yielded from pairing between a cryptic SD site in the forward donor backbone and the SA site of CtIP exon-2; thus, it carried a small insertion (+ 28 bp) of donor sequences together with the deletion of 3′-part of exon-1 (− 188 bp) (Fig. 5e; Additional file 1: Figure S6c, d). The lack of authentic start codon in these CtIP5′UTR transcripts might lead to usage of downstream cryptic initiation codons and significantly reduced protein translation. Collectively, with three different targeting strategies, we detected various aberrant CtIP transcripts produced from differently modified CtIP gene loci, which were all in-frame and produced altered CtIP proteins. These results are consistent with the critical function of CtIP in DNA repair, suggesting that these CtIP-disrupted cell clones were likely to be raised from escapee cells, which stood out from clonal expansion because of the partially functional transcripts and CtIP proteins. In this study, we readily achieved multiallelic gene disruption in hyperploid human cells through insertion of dual fluorescence reporters via CRISPR/Cas9-mediated homology-independent knock-in approach and observed diverse outcomes by targeting ULK1, FAT10, and CtIP loci, which represented non-essential, inducible, and essential genes respectively. First, through simultaneous knock-in of GFP and tdTomato followed by FACS-based enrichment, we successfully generated single-cell clones carrying complete disruption of ULK1 at all four alleles, lacking intact FAT10 in all three alleles, or devoid of intact CtIP at both alleles in LO2 cells. In particular, the efficiency for complete disruption of all four ULK1 alleles reached up to 46.2%. Subsequently, RT-PCR, sequencing, and western blot analyses confirmed the depletion of ULK1 and FAT10 transcripts as well as corresponding proteins, in the single-cell clones carrying corresponding gene disruptions. Importantly, we confirmed that the ULK1−/− cells generated through this approach displayed significant defect in clearing damaged mitochondria, which is consistent with the ULK1 function in mitophagy, while the FAT10−/− cells showed increased cell survival upon the treatment of TNFα and INFγ, which correlates well with FAT10 function in mediating apoptosis triggered by these cytokines. Interestingly, despite the complete disruption of CtIP gene at both alleles was successfully achieved through three different targeting strategies, the single cell clones obtained always preserved in-frame transcript variants. Sequencing analysis revealed various aberrant CtIP transcripts, suggesting that they were produced through diverse DNA processing and RNA splicing processes, including alternative DNA cleavage by CRISPR/Cas9 at the 4th nucleotide upstream of PAM, microhomology-based genome DNA recombination, and different alternative RNA splicing. These results are in line with the recent findings by Mou et al. and Kapahnke et al., which detected various exon-skipping/exon-deletion events upon introduction of loss-of-function mutations using CRISPR technology [27, 28]. Towards demonstrating the generality of this phenomenon, our data provided new evidence through distinct targeting approaches and showed that a broader range of cellular mechanisms could readily participate in dynamic DNA and RNA processing to yield escapee cells under survival stress. Collectively, our study demonstrated that the homology-independent dual-reporter knock-in approach provides a promising strategy to trace and enrich multiallelic gene disruption, which is particularly valuable to research on gene functions using diploid and hyperploid cell models. Meanwhile, together with previous studies, our data suggested that aberrant transcripts might be generated through various cellular mechanisms when disrupting genes essential to cell growth or survival, regardless of the methodology used. Recent technological advances have significantly empowered fast-forward genetics. Massively parallel sequencing has enabled efficient discovery of unknown genetic variants associated with human diseases . High-throughput genome-wide RNA interference (RNAi) screen has permitted rapid identification of causal genes responsible for specific cellular functions and phenotypes . 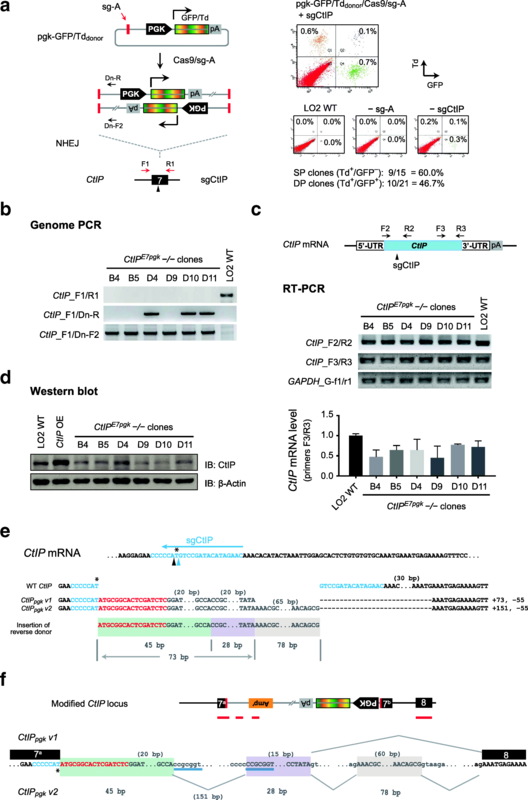 New approaches such as introduction of random indels by CRISPR/Cas9-induced NHEJ repair [11, 31, 32] or CRISPR interference (CRISPRi) mediated by fusing inactivated Cas9 to repressive KRAB domain [33, 34] have also achieved great success in unraveling genes involved in various cellular processes. Contrarily, function analysis of candidate genes, e.g., reverse genetics, has been hindered by various technical hurdles and often leads to inaccurate annotation or even misinterpretation of gene functions. The current challenges include but are not limited to incomplete depletion of target mRNA/proteins by RNAi or CRISPRi approaches, low efficiency associated with HDR-based knockout, and lack of means to trace and enrich target cells when indels or deletions are introduced via CRISPR/Cas9-coupled NHEJ repair. In this context, the homology-independent knock-in system established by our recent study provides an efficient tool to introduce complete gene disruption through the insertion of trackable reporters . The homology-free donor and non-mammalian sg-A target sequence have made this system easily applicable to any selected locus in mammalian genome . Moreover, the high efficiency of NHEJ-based knock-in could permit simultaneous knock-in at multiple alleles, while usage of dual fluorescence reporters followed by FACS sorting grants direct tracing of cells carrying multiple knock-in and likely multiallelic gene disruption. In this study, we employed this approach and achieved one-step generation of cell clones devoid of intact ULK1, FAT10, or CtIP genes, despite of their multiple copies in the hyperploid LO2 cells. This has allowed us to quickly assess the functions of disrupted genes, as well as the efficacy and limitation of the gene-disruption strategy in the current study. Intriguingly, while we fully confirmed the depletion of ULK1 and FAT10 transcripts and proteins, as well as the loss-of-function phenotypes in the single-cell clones carrying complete gene disruptions, our study detected various chimeric CtIP transcripts and demonstrated an apparently biased enrichment of minor events through cell survival. 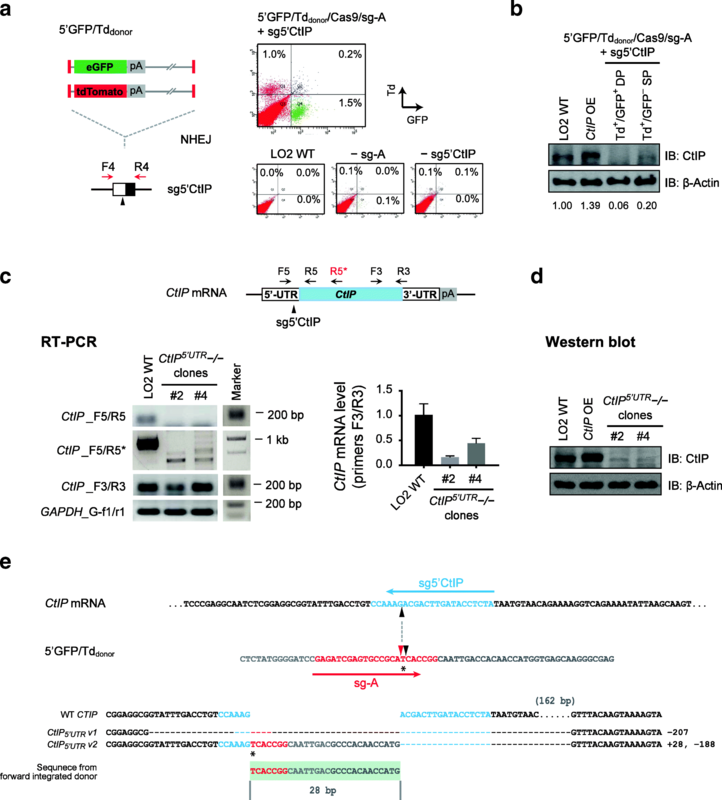 First, upon targeting CtIP exon-7 with two different types of donors, reverse integrations, which should not be enriched by FACS sorting, were confirmed in all CtIPE7ires−/− and CtIPE7pgk−/− clones examined (Fig. 3b; Fig. 4b). Moreover, despite the presence of forward integrations confirmed by FACS and genome PCR, aberrant CtIPires and CtIPpgk transcripts were only recovered from the alleles carrying reverse integration in these cells (Fig. 3f; Fig. 4f). Second, we observed alternative DNA cleavage by Cas9 at the 4th nucleotide upstream of PAM, in all CtIP-disrupted clones generated through three different strategies (Fig. 3e, Fig. 4e and Fig. 5e). This is apparently biased because DNA cleavage at the 3rd nucleotide is known to be dominant and prevalent [3, 16]. Finally, all aberrant CtIP transcripts preserved the original reading frame of CtIP mRNA and produced detectable CtIP proteins, despite the fact that they carried integrations of different donors and were produced through different DNA processing and alternative RNA splicing (Fig. 3f; Fig. 4f; Additional file 1: Figure S6d). Given the large numbers of cryptic splice sites within the donor sequences in either orientation, as predicted by Human Splicing Finder , the detection of only in-frame aberrant transcripts in all CtIP-disrupted clones strongly suggested that they were functional. It also suggested that preserving CtIP function might be associated with a survival advantage in LO2 cells. This is consistent with the critical function of CtIP in DNA repair , and it is supported by previous reports showing that ablation of CtIP gene impaired cell proliferation and early development in mice [23, 24]. Collectively, these results are consistent with the unexpected exon-skipping/exon-deletion observed by Mou et al. and Kapahnke et al [27, 28, 37]. Meanwhile, they provide new evidence through a distinct targeting approach. Our data showing the biased enrichment of minor events with three different targeting strategies further support the generality of this phenomenon, suggesting that essential genes may be spared from loss-of-function mutation/deletion/disruption through various cellular mechanisms. Hence, more caution is needed to interpret functions of genes involved in cell growth or survival, especially using a loss-of-function approach. Altogether, these data put forward new evidence on the tremendous flexibility provided through diverse cellular mechanisms, which is likely to be critical to ensure a functional output from the numerous DNA and RNA processing events in cells. The off-target effect of CRISPR technology has been intensively investigated and debated. Several studies provide evidence that off-target insertions or deletions were induced at low frequencies near the detection limit of deep sequencing, which likely had minimal impact on whole-genome mutation load [38–41]. Only one recent study showed unexpected high mutation rate from their in vivo work and evoked vigorous debate, but it has just been retracted by the publication group . Our previous study has also examined the off-target effect of homology-independent knock-in approach . In the current study, potential false-positive signals introduced by off-target integrations have been examined by the control experiments performed in the absence of sg-A or any gene-specific sgRNA targeting ULK1, FAT10, CtIP, or GAPDH (Fig. 2a, Fig. 3a, Fig. 4a and Fig. 5a; Additional file 1: Figure S2 and Figure S6a). Consistent with our previous study, compared to reporter signals produced by targeted integrations, non-specific or off-target integrations yielded only low signals negligible to the current conclusion. Multiallelic gene disruption could be readily introduced through CRISPR/Cas9-induced homology-independent knock-in of dual fluorescence reporters followed by direct tracing and cell isolation. Meanwhile, diverse DNA repair and RNA splicing mechanisms in cells may form a robust cellular mechanism to spare essential genes from loss-of-function modifications by generating partially functional transcripts. Hence, distinct functional outcomes might be yielded when targeting different genes, regardless of the strategies and tools used. The human codon-optimized Cas9 was a gift from George Church (Addgene # 41815) . All sgRNAs used in this study were designed and constructed as previously described [4, 16, 43], and their target sequences are listed in Additional file 1: Table S2. ires-GFP/Td donors: Single-cut non-homology (NH)-donor carrying a sg-A target site followed by ires-eGFP cassette was constructed in our previous study . A pair of oligos carrying multiple stop codons in three different reading frames was synthesized, anealed and inserted between the sg-A target sequence and ires-eGFP in single-cut NH donor to construct the ires-GFPdonor. The eGFP coding sequence in ires-GFPdonor was then replaced with the tdTomato (Td) gene to generate the ires-Tddonor. pgk-GFP/Td donors: The constitutive expression (CE) NH-donor constructed previously  was used directly and named pgk-GFPdonor in this study. The eGFP coding sequence in pgk-GFPdonor was replaced with tdTomato to generate the pgk-Tddonor. 5’GFP/Td donors: The ires element was removed from the ires-GFPdonor, using MluI at 5′ and MscI at 3′, to generate the 5′GFPdonor. Subsequently, the eGFP coding sequence in 5′GFPdonor was replaced with the tdTomato gene using MfeI at 5′ and NsiI at 3′ to generate the 5′Tddonor. Insertional disruption of GFP transgene: LO2 cells carrying GFP transgene at GAPDH 3′-UTR were established as previously described . Cells were seeded in 12-well plates at a density of 5 × 105 cells/well and were transfected using Lipofectamine 3000 (Thermo Fisher Scientific) following the manufacturer’s instructions. A total of 2.0 μg DNA (0.8 μg Cas9 + 0.4 μg sgRNAs + 0.8 μg ires-Tddonor) was transfected into each well. sgRNAs used included 0.2 μg sg-A and 0.2 μg eGFP-specific sgRNA. The cells were passaged 2–3 times before fluorescence imaging (Olympus IX83 Inverted Microscope) and FACS analysis (BD Aria Fusion Cell Sorter). Gene disruption by simultaneous knock-in of dual ires-GFP/Tddonor, pgk-GFP/Tddonor, or 5′GFP/Tddonor: wild-type LO2 cells were cultured as previously described  and were transfected with a total of 2.0 μg of DNA (0.8 μg Cas9 + 0.4 μg sgRNAs + 0.8 μg donors mixture) using Lipofectamine 3000 as described above. For each transfection, sgRNAs used included an sg-A and a site-specific sgRNA targeting different candidate gene loci (0.2 μg for each). When more than one donor was used, the amount of total plasmids was divided equally according to the number of donors. Transfected cells were passaged 5–7 times after transfection with 5′GFP/Tddonor and pgk-GFP/Tddonor, 2–3 times for ires-GFP/Tddonor, before FACS analysis (BD Aria Fusion Cell Sorter and LSRFortessa Cell Analyser). Genomic DNA was extracted from cultured cells using the TIANamp Genomic DNA Kit (Tiangen) following the manufacturer’s instructions. Approximately 200–500 ng of genomic DNA was used for each PCR reaction. DreamTaq polymerase (Thermo Fisher Scientific) was used for PCR screening to detect insertional disruption of target genes. The Phusion High-Fidelity DNA polymerase kit (New England Biolabs) was used to amplify the integration junctions for sequencing. All the primers used for genome PCR are listed in Additional file 1: Table S3. Total RNA from cultured cells was isolated using TRIzol reagent (Thermo Fisher Scientific), before being reverse-transcribed into cDNA using a High Capacity cDNA Reverse Transcription Kit (Thermo Fisher Scientific). PCR was then performed using the Phusion High-Fidelity DNA polymerase kit (New England Biolabs), and quantitative real-time RT-PCR was performed using the SYBR® Premix Ex Taq kit (Takara) in 7900HT Fast Real Time PCR system (Applied Biosystems). Measurements of transcripts were normalized to GAPDH, and samples were run in triplicates. All primers used for RT-PCR analysis are provided in Additional file 1: Table S3. Dn-F1, Dn-F2, and Dn-R represent primers binding to donor sequence at different locations. To achieve optimal PCR amplification, we used two different forward primers binding at donors, Dn-F1 and Dn-F2, in Fig. 2a and Fig. 3a respectively. For FAT10 RT-PCR, wild-type LO2 cells and FAT10-disrupted clones were treated with 20 ng/ml TNFα and 100 ng/ml INFγ for 48 h before RNA extraction. PCR fragments amplified from genomic DNA or cDNA were purified using the MEGAquick-spin Total Fragment DNA Purification Kit (iNtRON) and were then ligated into pGEM-T easy vectors (Promega) following the manufacturer’s instructions. Positive clones were verified by sequencing . Full-length FAT10 cDNA and CtIP cDNA were cloned by RT-PCR from human LO2 cell line and inserted into pcDNA3 vector under the control of CMV promoter. The plasmids were verified by sequencing, and then transfected into obtained FAT10−/− and CtIP−/− cell clones for functional rescue. Cell lysates were prepared as described previously . Samples with 10 μg protein each were resolved by SDS/PAGE and subsequently transferred to polyvinylidene difluoride membranes (Bio-Rad). Membranes were blocked with 5% non-fat dry milk in PBST buffer for 1 h at room temperature and then incubated with antibodies against ULK1 (Cell Signaling, Cat# 8054, RRID: AB_11178668), FAT10 (LifeSpan BioSciences, Cat# LS-C341638, RRID Number not available), CtIP (Abcam, Cat# ab155988, RRID Number not available), GFP (Santa Cruz, Cat# sc-9996, RRID: AB_627695), or β-actin (Santa Cruz, Cat# sc-47,778, RRID: AB_2714189) overnight. Membranes were washed three times with PBST buffer and incubated with HRP-conjugated goat anti-mouse (Thermo Fisher Scientific, Cat# G-21040, RRID: AB_2536527) or goat anti-rabbit (Thermo Fisher Scientific, Cat# G-21234, RRID: AB_2536530) antibodies. Signals were detected using the Amersham ECL select western blotting detection kit (GE Health Care Life Sciences) and exposed to Super RX-N film (Fuji). Wild-type LO2 cells were cultured as previously described , till 70–80% confluence. The cells were then treated with colcemid for mitotic arrest and harvested by standard hypotonic treatment and methanol/acetic acid (3:1) fixation as described previously . Slides were prepared by standard air-drying method on a pre-cleaned slide. Mitotic cells at metaphase were then imaged, and the chromosome numbers in each cell were examined by experienced cytogenetic specialists. Wild-type LO2 cells were cultured in 100 mm culture dish till 70–80% confluence. The cells were then trypsinized and swollen by 75 mM KCl treatment for 20 min at 37 °C and fixed by cold methanol/acetic acid (v/v, 3:1) for 5 min three times. Gene-specific BAC clones were purchased from CHORI, BACPAC Resources Center . One-microgram DNA of each BAC clone was labeled with spectrum green dUTP or spectrum orange dUTP using the Nick Translation Kit (Abbott molecular) following the manufacturer’s instructions, to generate a gene-specific probe. Commercial probes or BAC clones located near centromere or sub-telomere region in the same chromosome of a target gene were used as reference probes (Additional file 1: Table S1). Dual-color in situ hybridization was then performed in LO2 cells for each targeted gene, combined with a reference probe located in the same chromosome labeled with different fluorescence color. Cells and probes were co-denatured at 75 °C for 5 min and hybridized overnight at 37 °C. After hybridization, slides were washed in 0.4× SSC/0.3% NP-40 at 72 °C for 2 min and 2× SSC/0.1% NP-40 at room temperature for 1 min. Slides were then mounted with ProLong Gold anti-fade reagent with DAPI. Fluorescence signal of spectrum green and orange were examined and captured using Zeiss microscope with a × 100 objective. Wild-type LO2 and selected ULK1−/− clones (U-15 and U-16) were seeded on cover glass and treated with 10 μM Oligomycin (Sigma) and 1 μM antimycin A (Sigma) for 24 h. Cells were then washed with PBS and fixed with 4% PFA in PBS at 37 °C for 10 min. After washing with PBS, the cells were incubated with prewarmed 100 nM MitoTracker Red (Thermo Fisher Scientific) in PBS for 10 min at 37 °C for mitochondria labeling. Cells were then washed with PBS, and the mitochondria staining signals were examined and imaged using Olympus FV1000 confocal microscope. The viability of cells after drug treatment was determined by standard 3-[4,5-dimethylthiazol-2-yl]-2,5 diphenyl tetrazolium bromide (MTT) assay as previously described . Briefly, the cells were seeded at 5 × 103 cells/per well in 96-well plates and grown for 24 h before treated with 20 ng/ml TNFα and 100 ng/ml INFγ for 48 h. In MTT assay, the cells were incubated in MTT (0.5 mg/ml) supplemented medium for 2 h, and then, the medium was aspirated off. Dimethyl sulfoxide (DMSO) was added to dissolve the insoluble formazan product, and the colored solution was quantified by measuring absorption at 570 nm using a reference wavelength of 630 nm by a spectrophotometer. Chenzi Zhang and Xiangjun He contributed equally to this work. We thank Wing Ki Wong for critical and insightful comments on the manuscript. This study was supported by funds provided by the Research Grants Council of Hong Kong [TBF17MED002 to B.F.; 3132966 to W.Y.C. and CUHK C4014-14G to A.M.C.] and in part by funds from the Croucher Foundation [CAS16CU01/CAS16401 to W.Y.C. ], the National Natural Science Foundation of China [31771635 to B.F.], the National Basic Research Program of China [2015CB964700 to Y.L., and 2017YFA0104800 to J.C.], and the CUHK Vice-Chancellor Discretionary Fund [CUHK-Baylor College of Medicine Joint Centre for Medical Genetics Programme to Y.K.K and C.C.W]. CZ, XH, and BF designed the study. CZ, XH, YKK, FW, JX, KWS, and JR performed the experiments and analyzed the data. HZ, CCW, GGC, PL, JL, YX, AMC, and WYC provided reagents and conceptual advice. BF wrote the manuscript with comments from all authors. All authors read and approved the final manuscript. Human Splicing Finder. http://www.umd.be/HSF3/. Accessed 21 Jan 2018. CHORI, BACPAC Resources Center. https://bacpacresources.org. Accessed 7 Dec 2016.